A month and *almost* two weeks have passed since Robee’s arrival- a fact that I’m finding very difficult to believe. Through the whirlwind of sleepless nights, spitup, and diaper changes, our little lady is thriving and growing by the second! She smiles constantly (well, when she isn’t screaming bloody murder) and is turning into quite the little chatterbox, cooing at everything. . .she especially seems to love music, and will ‘sing’ along when sung to – the cuteness is unbelievable! She seems to like her play gym, and has just started batting at some of the dangling toys. She’s getting more alert by the moment, and we’re enjoying short spans of playtime during the day now. At her one-month checkup (which ended being almost a week late), Ro weighed in at 9 pounds and 3 ounces (50th percentile) and was 23 inches tall (95th percentile)! She seems to be getting big so much faster than her big sister did – I almost can’t believe how much she’s gained. If she keeps on growing at this rate, I might actually get some chubby baby thighs to gnosh on this time around! Grow, baby, grow! And speaking of sleep, we’re still battling over bedtime. . .and I’m still losing the battle. One thing is sure, Ro is just as stubborn as her sister (and her dad). She’ll sleep for hours in the swing. She’ll sleep for hours in my arms. If she’s in bed with me, she’ll sleep practically all night without stirring. But if I put her in her cradle, 30 minutes is the best I can get out of her before the bloody murder screaming starts. *sigh* The solution to this problem has me boggled, and I suspect that this will be her battle to win. . .at least until our attic room and T’s room are finished. At that time, Ro will no longer be rooming in with the ‘rents, but will be sleeping in her nursery. It will be far easier to stand my ground when she starts wailing at 3 am without my warm, inviting bed only inches away promising an end to the drama if I just give in and let her sleep with me! Of course the flip side of this is that, as long as I let Ro cosleep, I get to sleep nearly the whole night through. So yay for that! Otherwise, all is well! Ro’s cord stump finally fell off on the 7th of this month – WE HAVE AN OUTIE! 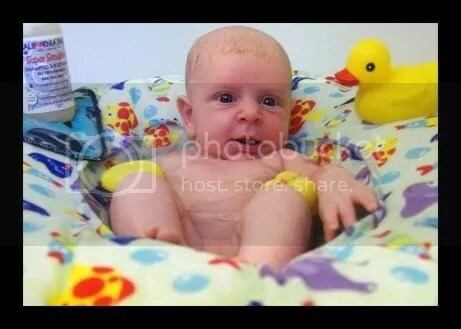 It continued to bleed for about a week, but when it finally stopped, we plopped her into tub as fast as she could say ‘aaaaaaaaah!’ Her first bath was on the 16th of May, and since then she’s had her second and third. . . Robee LOVES the water, and will happily stay in there as long as we’ll let her. 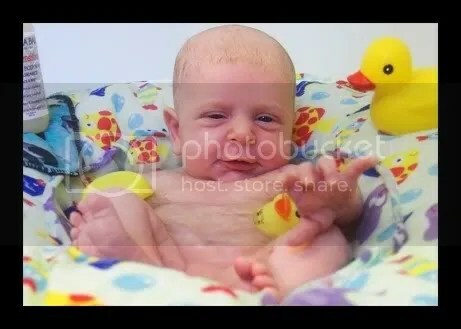 The rubber duckies were provided courtesy of the big sis, who feels that ducks are a necessary part of a good tubby time – regardless of age. Ro has been nicknamed ‘Squeaks’ because she makes such silly little squeaky noises – has been since day one. I’ve never met another baby that squeaks like she does, and I’ve met my share of babies! It’s so cute, even though she sometimes sounds as if she needs an oilcan. . . Squeakers, Squeaky Squeakerton, and Squeakatronic Supersonic are all spin-offs of this basic nickname. You should hear T say that last one! Speaking of T, she has been perfect in the role of big sister. She really loves her little Ro, and has already begun ‘teaching’ her how to do some big-girl things. When the above picture was taken, T was telling Ro all about how she’ll be able to play with paints when she’s a big girl, and explaining that red and blue make purple, which is her favorite color. . . so cute! I can’t wait to watch them play together more as they grow, and see if T continues to try to teach her little sis everything she knows! Teaball calls Ro her baby, which is amazingly adorable! And last, but not least, Ro was introduced to the bottle last weekend. She did great! I think its good to keep a few bottles of pumped breast-milk in the freezer for those times when momma needs a break – ‘s good to make daddy do some of the work once in a while, neh? It was obvious that Ro was a bit confused about why her milk was coming out of . . . not mommy, she was happy to drink it regardless of the source with only minimal sputtering. 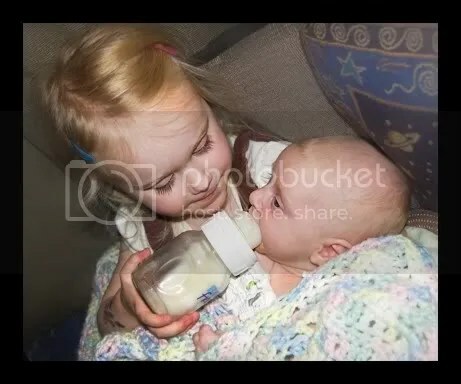 We let T take a turn and feed some of it to her little sis, she was so happy to be able to help! Now that the bottle is a possibility, my mommy-leash has gotten a bit longer, and Robee can be left at home with her dad sometimes! How cute!! I need to come over and visit again! She’s getting so big!!!!!!!! She’s adorable! Maybe I’ll have to sneak on Susans computer at work and put that ducky pic on her backround cus the one she has is getting old! HaHa I think she’ll like this one better to cus it has Ro on it! Oh and there’s nothing better then sisters but of course you already know this! awww way super cute! I’m glad that she’s doing well and growing and that your leash has gotten a tad bit longer, even if she’s still bunking with you at night. It’ll get better…you know it will!! Thanks for the baby and little girl ( big girl if you read here these:) fix. I always liked getting sleep however, and yeah for you introducing the bottle soon . I waited too long with my first , and so hated the pumping thing. I don’t know where the time has gone lately. Sometimes my very much older children are not really. It’s all good. Deb. . . there are no words in this world with which I can express to you my deep and severe loathing of the breast pump. Hate is far too gentle of an expression. However, since I don’t have to work outside of my home every day, I figure that pumping every now and then won’t hurt, and it is totally worth it to get a few inches added to that leash for those times when I need it! Great post, so much fun to catch up on Ro. I LOVED the picture of T painting with Ro in the background. And the commentary about red and blue make purple. I know adults who don’t know that. If Ro listens to T she’ll be in college by kindergarten. Ro is a cutie!! I know T just loves her to pieces. 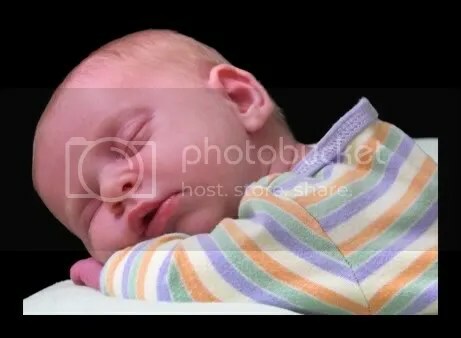 Hope sleep comes easily and quickly tonight!! For the first two months of Natalie’s life, she’d only sleep if someone was holding her. It was not fun. Then she graduated to sleeping in her swing until she was five months. After that she’d finally tolerate her crib. 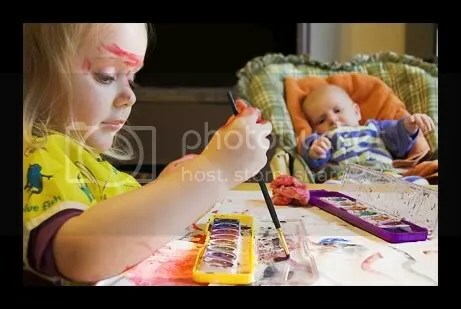 I love the picture of T painting with baby Ro in the background! too sweet! I am sure T is in LoVe and big time!